It appears that in the 'After' shot there seems to be more light 'splash' and less focus. Yeah I noticed that too. Actually I just went for a drive around the block and I gotta say that for a first impression, I'm not impressed by the uniformity of the beam pattern. I wish the parts for a proper HID retrofit weren't $400+ and didn't require removing and opening the headlight assembly... Ugh. Not sure whether I'll be keeping these but I can't stomach the thought of paying to do it the "right" way at the moment. Nice before and after photo's. Obvious difference. As for the real world do not expect a beam. The lens dissipates the light. The brightness however will bring it in to the "safe" area to drive over 50 MPH. Unlike the OEM. Thanks for the feedback. I haven't done any night driving at highway speeds with the new lights, so I'm definitely interested to see if my opinion changes with time. At the minimum I'm glad to contribute to the conversation here. If anyone could shed more light (edit: pun not intended) on the "right" way to upgrade the OEM headlights, I'm all ears. I just may not be able to afford any other solutions in the immediate future. To me the only solution is to add a aftermarket driving light. Best solution would be a light/push bar. Both of these were taken with a Canon T6i with settings of f/8, 1/40 sec shutter, ISO 6400, and focal length of 29 mm. Because the settings on the two photos are identical, the differences in the photos is very similar to what you'd see in person. 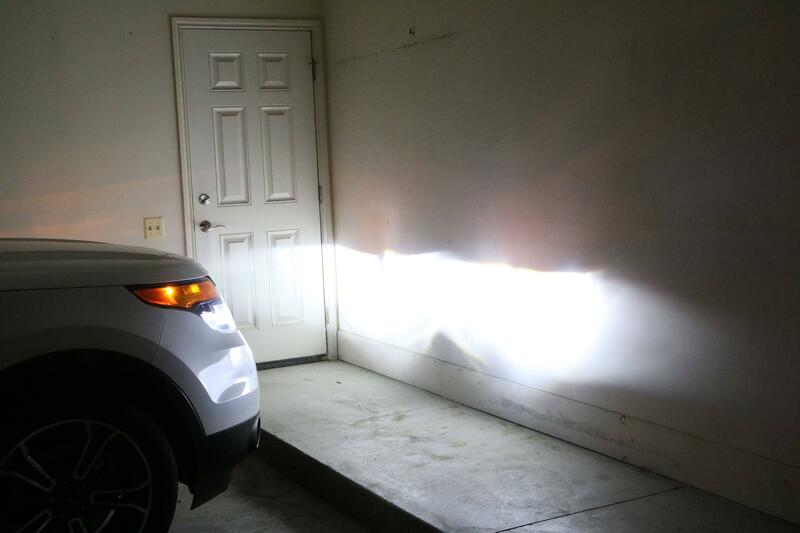 Both shots are of the low beams. I couldn't get accurate shots of the high beams for reasons not worth elaborating on. Edit: Removed unnecessary rambling. The difference should be pretty obvious. BTW, I've just installed these in my garage at 3pm so I don't know about their real world nighttime performance yet. Also, I parked slightly at an angle, so please disregard the fact that the driver's side throws more light on the wall in this photo. For anyone else who gets these particular lights (OPT7 9005), you just need the little adapters on the top half of the box (no need for the wires in the separate box on bottom). I'd recommend plugging those adapters into your Explorer's harness (mine needed a little extra "oomph" and I dropped one of the LED's once or twice), then connect the LED to the harness. Then it's really just a simple plug-n-play installation. How are these holding up? Rather curious as I want to do something with my 15 sport, the stock halogens are down right dangerous. I saw a lot of 1 star reviews on amazon for these, but half of them seemed to be people complaining about the pattern who didn't adjust them. If they are still doing well for you I think I am going to order them. The difference in light pleased my wife. nuff said. Some of those that have replaced the halogen high beams in the 2016/17 models with LED have reported that while the light is brighter, the downside seems to be that they don't have the same distance. I'm guessing this is because of the internals. I believe that halogen uses a projector lens while LED reportedly uses a reflector. The internals are designed for the type of OEM bulb the factory installs so mixing in different types of bulbs will usually result in different issues. The short answer is that I'm highly interested in a proper HID retrofit but don't have the time or money right now. The color is too blue, the beam pattern is sub-optimal. They're better that the halogens, but that isn't saying much. The Halogen is powered to 900 lumens. The Led are 2500 Lumens. The Lumens definition is: "a unit of luminous flux in the International System of Units, that is equal to the amount of light given out through a solid angle by a source of one candela intensity radiating equally in all directions"
Stole this from another website. Now as for Halogen "seeming" to light further away then LED it has not been my experience. Before changing I could not see the roadside driving at 50mph. Now I can see much farther. It is not a sharp beam because the glass lense dissipates to a extent any beam. The Halogens were also affected. Find your bulb number and search on EBay. See if you can find the $39.00 LED's and install em. Champco I've been interested in those leds but wondered how they do in warm weather. Any issues in hot temps with them overheating? I am north of you. Was a good hot summer and i drove at night a lot with no indication of any failure. Many 90 degree nights. To me this is not hot. I spent many years in the Sonoran desert. Day after day of hot would be the test. Which brand did you go with? How do these compare to hid kits? I would also assume the leds would last longer than hid. The guy at The Retrofit Source suggested the 9005: Morimoto Elite to replace the headlights. However he did inform me that it has been a mixed reviews regarding the wiring fitment. Some people have had no issues at all and some has/had issues. So I am trying to see who has them installed and looking for reviews, how-tos and suggestions. I just upgraded my 14 Ex Sport lights to the BPS G7 LED kit. This is a Canadian vehicle and was a complete plug and play. Took me about 15 min to install. No special tools required - only a flashlight to see better! It did come with a ballast looking thingy though which you need to mount somewhere. Upon unboxing, the kit looks solid and performs better than expected. Colour wise they are the 6500K and are more bluish-white than the factory lights. It says they are 4000 lumens per bulb. I took it out tonight on some back roads and I'd say it's at least 50% better than stock. The high beams are fantastic and the line cut off is very straight. Does anyone know the color of the led fog lights & low beam head lights? 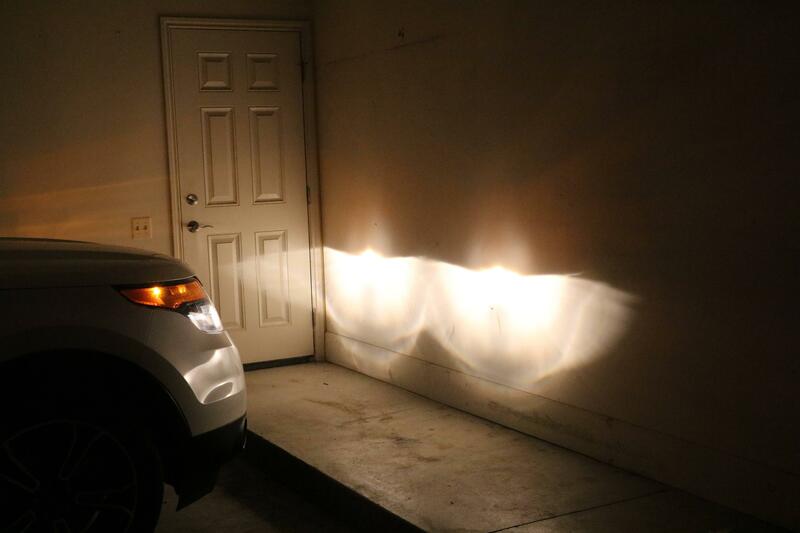 Thinking of changing the high beam to led, but want them to match the others? Would the correct color be 4300k or 6000k? Pretty sure there are pictures in that thread that show the comparison as well. Edited to add the US Amazon link to the lights. Merged with this suggested thread (post 117). I'm very interested in these also for my Canadian '14 Explorer Sport. The stock headlights are useless. Did you need to modify the cover boot? How has your experience been after a few months? EDIT: Looks like there is a newer generation with even HIGHER (12000 Lumens??) output! !